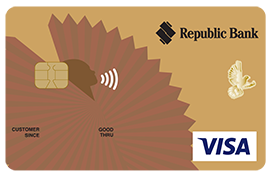 A Republic Bank Credit Card is a safe and convenient way to make purchases and and earn great rewards. As a result of the ongoing challenge with foreign exchange availability, effective immediately and until further notice, you can only use up to a maximum of US$15,000 or up to your credit limit if your limit is less than US$15,000, per statement cycle. This change does not affect transactions on the TT$ side of your account. 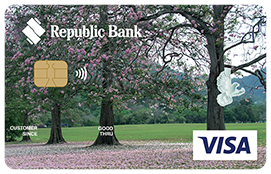 Republic Bank Credit Cards with Chip and PIN technology! Our Chip and PIN credit cards were the first to be introduced in the English-speaking Caribbean. It reduces fraud, making credit card transactions more secure and enhances the overall customer experience. The embedded microchip on the card stores data more securely, preventing it from being easily copied or altered. The unique Personal Identification Number (PIN) means that only you can use your card and do so securely. These cards are also globally accepted, including in Europe and in the UK. You can earn Bonus Points every time you make purchases with your Republic Bank Credit Card. The more you use your Republic Bank Credit Card, the more Bonus Points you accumulate and the more Bonus Points you have, the more you save! Get the flexibility to redeem your Bonus Points for travel on any airline at any time or for rebates and discounts at over 400 merchant outlets for furniture & appliances, medical assistance & supplies, gym membership, warehouse shopping, utilities, department stores, shoe stores, jewellery, gifts, perfumeries, restaurants and much more! Get one (1) Bonus Point for every TT$50/US$15 you spend. Plus, Republic Bank Bonus Points are valid for three (3) years! You can receive up to 50 days interest free credit once your credit card balance is paid in full by the payment due date for two consecutive months. 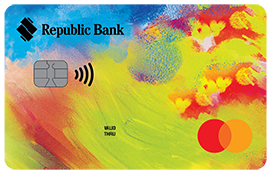 Your Republic Bank Credit Card has Chip and PIN technology which allows for easier acceptance globally, especially in Europe and the UK. 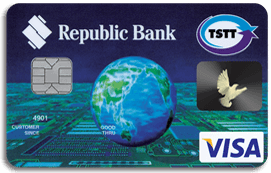 Your Republic Bank Credit Card can be used at thousands of merchants locally and millions of merchants internationally where Visa and Mastercard are accepted. Get access to cash locally and internationally via any ABM that displays the Visa and Mastercard logo. BalanceCover provides coverage for your credit card balance when you need it most. You never think it will happen to you, but sometimes misfortune befalls the best of us. Indeed, that very misfortune can create the Credit Card debt your loved ones may be responsible for afterwards or sometimes the unexpected can occur during a period of high Credit Card usage. That’s why you need BalanceCover. BalanceCover from Republic Bank is a group coverage plan that covers your Credit Card’s outstanding balance and repays or reduces your Credit Card debt in case of death or disability. BalanceCover is great for everyday peace of mind and to safeguard your family. All official cardholders on the same account are covered for the cost of one. Each Insured Cardholder shall be covered for an amount equal to the Total Amount Outstanding on his/her Credit Card at the date of death. In the event of Accidental Death, an additional amount of $25,000 will be paid to the Insured Cardholder’s estate. Temporary Disability shall mean that the Insured Cardholder cannot perform his occupation as a result of accidental bodily injury, sickness or disease. While receiving benefits for Temporary Disability, the Cardholder must present a Medical Certificate every three (3) months. Total Permanent Disability shall mean the Insured Cardholder is in a state of total, permanent and irreversible incapacity and is continuously disabled as a result of sickness or injury and is unable to perform in any and every duty of any gainful occupation for which he/she is or may become reasonably qualified by education, training or experience, provided such disability existed continuously for at least six (6) months. For more information on the terms and conditions and how to enroll, call 627-3348 or come into any of our branches. Get up to 15% discount on Hertz Rentals* (available in the US, Europe, Latin America, Australia, New Zealand, Africa, Middle East and Japan – the discount may vary per country. Ensure that you have the special discount code and that bookings are made through Lazzari & Sampson (627 8201/1945). Discount is applicable once the individual is paying with his/her Republic Bank International Credit Card for their full annual premium with COLFIRE and that the Cardholder is also the Insured. Get 20% discount when you pay with your Republic Bank Credit Card. The cardholder’s name must match the name on the insurance policy. The discount is facilitated if the payment is made through a COLFIRE Branch. Discount is applicable to private vehicle insurances. Please note however, that COLFIRE policyholders are entitled to their Safe Driver Discount (NCD) and any other three (3) discounts they qualify for (Republic Bank Credit Card discount included). For more information call: 800-QUOTE. 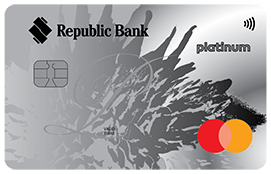 Do you know that your Republic Bank Credit Card can provide you with superior benefits and rewards? To ensure that you are not missing out on some of the wonderful benefits that your Republic Bank Credit Card has to offer, we have developed a comprehensive list of useful tips which will help you manage your credit card and maximise the great rewards! 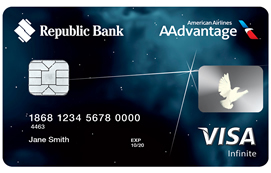 Use your Republic Bank Credit Card instead of cash for your everyday purchases such as utility, mobile and grocery bill payments and earn either Republic Bank Bonus Points or AAdvantage miles. Bonus Points can be redeemed at over 400 merchants nationwide for travel on any airline at any time or at restaurants, supermarkets, fashion outlets, home improvement stores and much more! AAdvantage miles can be redeemed at hotels and car rental companies worldwide as well as for travel on American Airlines and at 20 partner airlines including British Airways and Cathay Pacific. 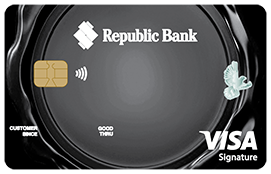 Only a Republic Bank Credit Card has Chip and PIN technology. When you enter your Personal Identification Number (PIN) at all chip-enabled terminals both locally and abroad, it will ensure that your transaction is authenticated by you. Change your PIN to something that is tied to your personal information to ensure that it can be easily remembered. The PIN must always be a four (4) digit number. Not yet signed up for RepublicOnline? Visit https://republiconline.republictt.com to apply today! Not yet signed up for RepublicMobile SMS Banking? Visit https://republiconline.republictt.com to apply today! Remember, with your Republic Bank Credit Card you can get up to 50 days’ interest free credit! To find out more about our Automated Payment System, call our Customer Service Department at 627 3348. Diligently monitor your credit card transactions to make sure that you are less susceptible to fraud. You can track your spending anywhere, anytime with RepublicOnline and RepublicMobile. Your credit card should never be left out of your sight! Be sure to ask the waiters at your favourite restaurants if they have a wireless credit card terminal so that you can settle your bill right at the table with speed and ease, as well as eliminate possible fraudulent ‘skimming’ opportunities. If the restaurant does not have a wireless terminal, be sure to accompany the sales representative to the terminal area to complete the transaction. If you require an increase in your credit limit to cater for vacation, personal or even home expenses, simply go into any one of our 34 branches with your most recent pay slip and fill out the relevant form. Be sure to apply early to ensure that your limit increase can be processed in time for when it is needed. Before you travel abroad, always visit www.republictt.com to familiarise yourself with the benefits that your Republic Bank Credit Card has to offer. 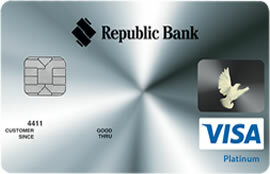 Be sure to use your Republic Bank Credit Card to make your travel bookings such as airfare and hotel accommodation. Pay the full cost of your ticket with your Republic Bank Credit Card and benefit from FREE Travel Accident Insurance coverage for you, your spouse and dependent children under the age of 23 years. Visit www.republictt.com to learn more. Republic Bank has a superior fraud monitoring system so that you can have peace of mind when travelling abroad. Ensure that you enjoy uninterrupted service and convenience with your Republic Bank Credit Card when you travel by advising us of your travel plans. Simply call our Customer Service Department at 627-3348 and inform us of your travel dates and the country you plan to visit (if in the USA, please advise of the state). This will allow us to monitor your transactions and avoid any unauthorised/fraudulent credit card activity. 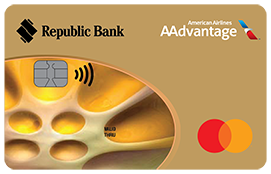 Always note your credit card account number and the relevant Republic Bank Mastercard/Visa assistance numbers that are located to the reverse of your card. Store the number in a safe place, in the event that your credit card is lost or stolen you can contact the relevant assistance centres. Be suspicious of unsolicited emails that appear to have come from us, asking you to verify personal or financial information. These emails can offer rewards, asking you to provide your credit card account information to process these prizes. We would never send you an email or SMS requesting personal information so please disregard these types of messages. Republic Bank is always rewarding our customers through customised and exclusive credit card promotions or value-added discounts at merchants. This gives you the opportunity to get extra value from your credit card as well as the chance to win great prizes! 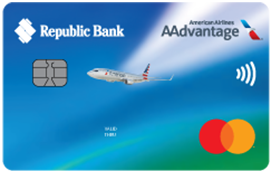 Be sure to visit www.republictt.com regularly to learn what’s new and exciting regarding our credit cards and read your credit card statement inserts so that you can benefit from these offers. Using your Republic Bank Credit Card for all your purchases can actually make you save time and money through the rewards you earn. It provides a reliable and safe payment instrument for your purchases both locally and abroad while providing superior fraud monitoring systems and security features such as our Chip and PIN technology, free insurance coverage and value-added benefits. Remember your Republic Bank Credit Card, if used wisely, can be your tool to effectively manage your finances and reap great savings everyday! No interest will be payable on any amounts debited to the credit card account if the outstanding balance is paid in full by the payment due date shown on the principal cardholder's current billing statement. Payment must be paid in full by the payment due date for two consecutive billing statements. Other fees associated with credit cards are available upon request.